"Apparently if you want to book it you have to say: 'The Efe Obada room please.' That's really cool. "If someone's in there, I'll just kick them out..."
Efe Obada is joking about the meeting room we are about to enter at the NFL's UK headquarters in central London. This is the room's first meeting and a recently cut opening ribbon now hangs loose around the doorframe. Oversized golden scissors lie on the table and from the wall behind, one huge picture dominates the space. It shows Obada, surrounded by a sea of his Carolina Panthers team-mates and grinning widely, just like everyone else. The photo was taken after the 26-year-old Briton's stunning NFL debut in September 2018. It captured the special joy of a landmark moment, the culmination of an extraordinary rise. It feels like it is a story he is still making sense of. Especially the part where it all began. Born in Nigeria, Obada moved to the Netherlands to live with his mother when he was eight years old. Two years later, he and his sister were taken to London. The details of how they came to arrive in England's capital are still unclear. The word "trafficked" has been used, but Obada has not exactly described it in those terms. The most open he has been on the subject was in a blog on the Carolina Panthers website in August 2017. Writing there, he said he and his sister were brought over "by a stranger who was supposed to look after us - they did not". Revisiting that time now, he is reluctant to share full details of the traumatic experience. But what is certain is that at the age of 10, he was abandoned with his sister on the streets of Hackney, east London. They spent two nights sleeping rough before a security guard gave them shelter in the tower block he was working in. With his help, the children were eventually looked after temporarily by a friend of their mother. When that arrangement broke down, Obada spent the remainder of his childhood in more than 10 different foster homes. "It was my life. It was my story," he says. "It was what I was going through. "But at the time it was normal for me. It was my surroundings. You have just got to survive. Do you know what I mean?" Obada's sister was with him throughout their time in foster care and they remain close, but he refuses to share anything more about her. It's a similar story with his wife - "his rock". He has said they met in London and that she "saw the broken child and loved it out of me". But her name? Off limits. "She's for me," is Obada's clear response to that inquiry. The nature of his relationship with his mother now is another unknown. Talk of dressing-room bonds being like family often feels like a sporting cliche. But in the context of Obada's childhood, the words feel more powerful hearing him say them. "For me, it really is," Obada says. "I grew up in foster care. To be in a team, it really is like a family. There are a lot of guys that have taken me under their wing. It's nice to belong somewhere. "The locker room is like a second home. You have your own space but you are part of something bigger than you. "It's nice to be wanted and to feel like you are needed. I feel like I can help this team and they make me feel that way, that I'm important to them." Even discounting Obada's childhood struggles his journey to the NFL has been remarkable. The established route is through the incredibly competitive US collegiate system in which just 1.6% of the player pool actually make it to the big time. When his future football peers were graduating from college aged 22, Obada was working in a factory in Welwyn Garden City in England. He had never played competitive sport in his life - let alone the notoriously complex game of American football. His introduction came after a chance meeting with an old friend. Obada was encouraged to attend a training session with British American football team London Warriors. At 6ft 6in he had the stature to succeed. He also had the attitude to make it - not least because football offered him the opportunity to channel the aggression from his difficult childhood in a positive way. After just five games with the Warriors, Obada was on his way to the United States. He attended a Dallas Cowboys practice session when they were playing in London in 2014. In April 2015 the Cowboys signed him - but he was released without ever playing a game. He also spent time with the Kansas City Chiefs and the Atlanta Falcons before once again being let go. "In the early days there was a lot of noes, but I was used to that," he says. "When I was growing up trying to apply for jobs in London and I didn't have papers, I would go through the interview process but then it came to: 'Where's your passport?' I got my noes from there. "An opportunity like being in the NFL is something that you are going to have to hold on to as long as you can, because I know that once that opportunity is gone I am back in the warehouse doing 9-5. "So that was my thing. As long as there is a chance and there are people around me that can help me through the door and give me the chance to progress and to grow, I am going to keep coming back - no matter how many noes I get." The NFL's International Pathway eventually provided a yes. A programme set up in 2017 to give international athletes the chance to make it, Obada was part of the first intake. Foreign-born NFL players are rare. Less than 3% of players in the 2018 season were born overseas. British players are rarer still - historically, Canada, Germany, and Jamaica have contributed the most non-American players. In the 52 editions of the Super Bowl to date there have only been five Britain-born winners - most recently the Philadelphia Eagles' running back Jay Ajayi in 2018. The NFL is keen to grow the game internationally, and particularly in the UK. Its plush central London headquarters overlooking Leicester Square attests to this, as do the four regular-season NFL matches the capital will host next season. 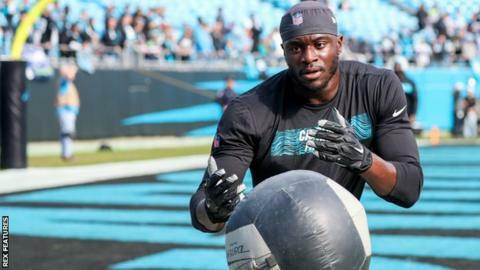 But for the chance to shine through that international focus, Obada might not have found himself assigned to the Carolina Panthers. He could well have followed a very different path in London - and this is a fact he is keenly aware of and a big motivating factor behind his regular trips back. Obada spends much of his downtime either reading about London's youth violence problems online from the USA, or trying to do something about it. Three of his friends when he was a teenager were killed in gang violence. It remains an issue close to home. In 2018, there were 132 murders in London, of which 57% were stabbings. In the year ending March 2017, for every 100,000 people in the capital there were 168 knife offences, with young black and minority ethnic males disproportionately affected, as victims and perpetrators. "Last year was bad. Every generation tells you: 'Oh, the kids nowadays are bad.' But the kids aren't bad, the environment is bad," Obada says. "I feel like I'm a product of my environment. Put me in an environment like the NFL and I'll thrive. Put me in an environment like south London with no help, no support, with funding cut left, right and centre, with charities closing down, youth clubs closing down.... All these different outlets for kids to learn vital skills in life are getting shut down because of the way things are set up." Obada plans on setting up his own foundation in the future but for now pours his energies into a charity called the Big Kid Foundation. It seeks to "equip young people at risk of social exclusion and youth violence to take control of their lives, find, develop and act on their own potential". One of its missions is to "see a capital where no young person loses their life to violence". Obada is now a regular at its events and has a natural kinship with the attendees. "I grew up around that," he says. "I grew up in south London and I know how easy it is to get pulled into certain things. I just want to help them. I just want to show them that they're just going through what I went through - running around, trying to find themselves. None of us have got a map, do we? "I'm just trying to say to these kids, I came from where you are and this is what I have done. My life was like this. My life was negative at one point and look at it now. "I just want to pay it forward, to be around them and say things to them that I wish people said to me at that age." Talk of Obada's role as a mentor inevitably leads on to the men who performed that role for him. People like Aden Durde, who spotted Obada's talents while working as a coach with the London Warriors, and Will Bryce, the head of the NFL's International Player Pathway programme. "Aden took time out of his life to train me," Obada says. "He took time out of spending time with his kids and his wife to believe in me. Will Bryce the same. "I am getting emotional just thinking about it, how these really good men invested in me. For someone like me, it's amazing. I'm blessed. Honestly, I'm very blessed." Fast forward to 2019 and everyday life is very different to Obada's days working in a warehouse. The year-long contract extension he signed in January is worth £432,000 - reward for a breakthrough season with the Panthers. Obada's 10 appearances last term included that eye-catching debut against the Cincinnati Bengals, where he ended up with the game ball, a de facto man-of-the-match award from his team-mates. Such fame and fortune would have been unthinkable for the 10-year-old who arrived in London feeling one overriding emotion. The frightened boy sleeping on the reception room floor of a Hackney high-rise is now sitting in a plush central office meeting room that bears his name. "When I got into the NFL I had this huge opportunity to 180 my life and set myself up in terms of financial security and looking after my family, my wife and my sister," he says. "Knowing normal people would take years to achieve some of the things the NFL provides, you just have to run at it. You have to be determined. You have to face whatever it's going to throw at you. "And that is really what I'm doing. I'm just making the most of an amazing opportunity that not a lot of people in this world have." Is the NFL Combine sport's weirdest test? What is a manager's interview really like? Why has momentum slowed behind Joshua? Has Mourinho been left behind and can he reinvent himself? Our guide to everything you need to know about American football and how you can get involved in your own 'game day'. Are you an NFL rookie? If so, watch our guide to the key rules, the player positions and the ultimate aim of the game. How to get into American football – a sport for all shapes and sizes that requires both mental and physical skills.